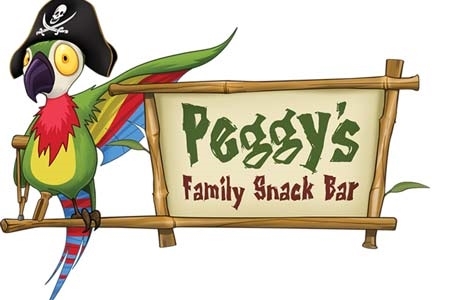 From sunrise to sunset Peggy's Snack Bar serves hungry pirates every day while they work or play. One of Blackpool's largest all day snack bars serves full English Breakfast until the sun is high in the sky and the main meals have been lovingly prepared. A great choice of hot and cold meals, are served from the counter including daily specials from our head pirate chef, so there’s always something new to try. The Peggy's Snack Bar family Meal Deal includes 2 adult meals and 2 children meals all for £9.10, feed the family with money to spare to enjoy your day out in Blackpool. Our family snack bar caters for children of all ages and those under 10 EAT FOR FREE all day everyday, one free kids meal with every paid adults meal. One child must be present per free kids meal claimed. Peggy's Snack Bar is one of Blackpool's largest all day snack bars serving a great choice of hot and cold meals from the counter. Prices start from £4.15 for Breakfast and £4.25 for Main meals, we also offer a family meal deal.